Hi friends! I'm up on the Gossamer Blue blog a new version of Pattern Play that was inspired by something in the background of the photo I chose to scrap. I had these photos that were taken in front of a bridal shop in a quaint little village called Old Town Spring, near where I live. We were hanging around the shops when these photos were taken of my girls telling secrets to each other. I have no idea what they were whispering but I'm so glad this moment was captured. As I started thinking through this layout, I kept going back to the pretty A-line dress and that's where I felt the inspiration hit. I pulled out my triangle punches and started punching out large and small triangles and arranged them on my page to mimic the dress. I used 13 different papers on the various triangles throughout the page and a few more for my photo layering, background paper and title. I think I counted 17 different patterns by the time I finished yet it doesn't feel like it. I chose to use my electronic die cut machine to create the title, which I placed at the top of the triangle dress and around the photo and layers. I added a clear frame over the photo to highlight the girls in the photo and finished off the layout by adding a few more embellishments here and there. So tell me, what do you think of how I extended the background of my photo onto the page? 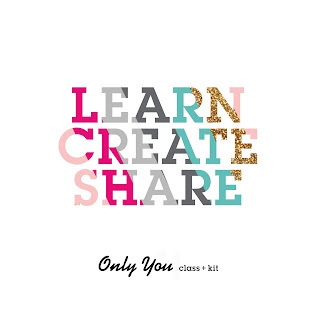 Do you ever do this - hone in on a little detail or element and repeat it throughout your layout. I'd love to hear your ideas. Great layout! The triangles and layers behind the photo are fabulous! This page is very beautiful! 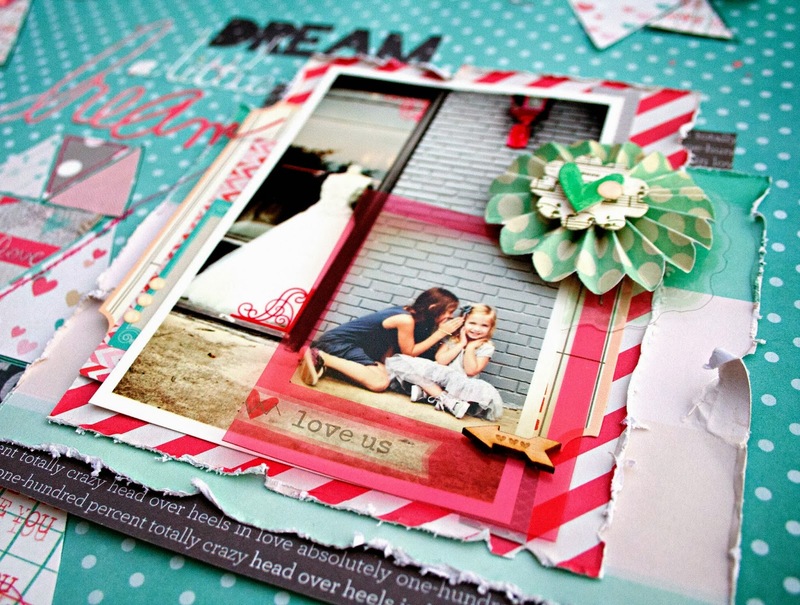 Love the colors and your use of the punches. Beautiful! I love this layout and the colors. What a lovely picture of your little ones. Gorgeous colours and I'm lovin the stitched triangles . Love the colours and the triangles!! This is just fantastic!! I don't mimic elements in photos, though I use the same colors most often. But the colors here are gorgeous - it just catches the eye. 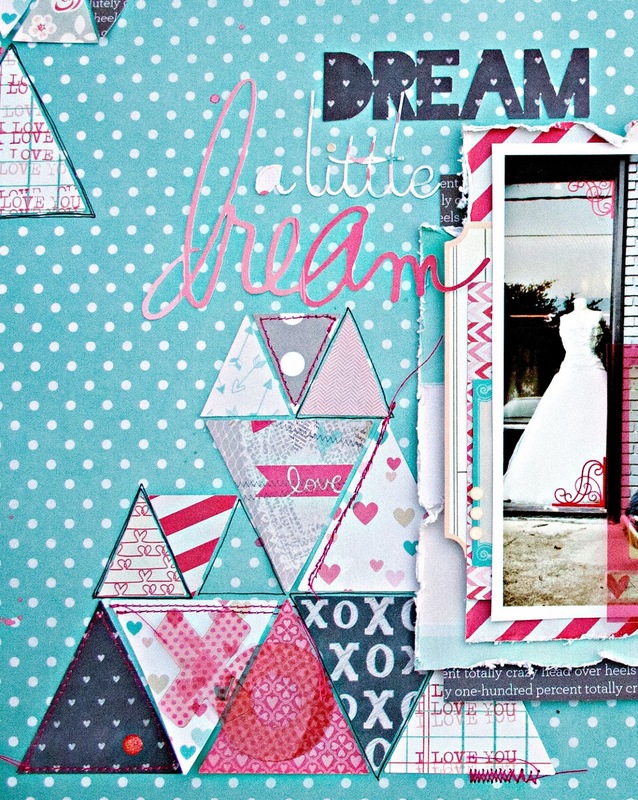 LOVING the distressed paper and triangles--GREAT layout!